This Nativity set is made from acacia wood in a remote village called Banaue in the the Ifugao province of northern Philippines. This area is the home of the UNESCO World Heritage Banaue Rice Terraces, which rise from the base of the mountains and span several thousand feet high. The terraces were built about 2,000 years ago by villagers using their hands and stones as tools. 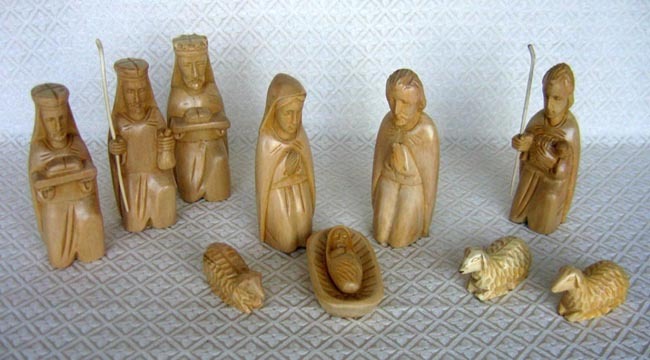 The set includes 10 figures: Joseph, Mary, baby Jesus, a shepherd holding a lamb, three sheep, and three wise men with gifts. The larger pieces are 6.5 inches tall. Richard Calingaya and a few other carvers sell their Nativity sets in their village market to financially support their families. This work supplements their farming income. Each figure is carved the ancient way, using chisel and mallet, from one solid piece of quality hardwood. The finishing is also done completely by hand. Since the global economic recession is affecting tourism in Banaue, most wood carvers are now leaving the village in search of employment in the cities.